Application updated to support iOS 10 permissions model for Camera and Photos. IT'S GOOD DESPITE THE OTHER REVIEWS!! My dogs are little rescue puppies and when we got them we had no clue what they were. I found this app and tried it out and it gave me one main option as well as several others on what they could be which was great! A lot of people are complaining though. Of course the app needs to be updated, the interface is a bit dated. But the idea that the app isn't 100% accurate it ridiculous. OF COURSE IT WON'T BE 100% CORRECT, YOU'RE ONLY SENDING IN A PICTURE NOT A DNA SAMPLE! This is the best free app there is no question it gives you all the information you need. 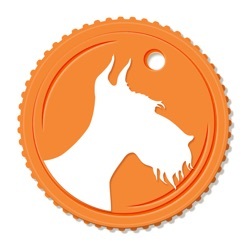 If you want complete accuracy buy the $5.99 app or get your dog a DNA test!! 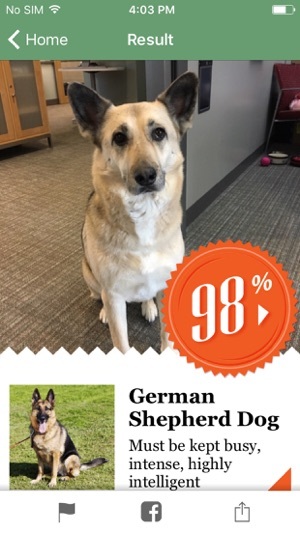 You can't seriously think an app will guess your who-knows-what mutt accurately?? Did you expect some Houdini-magic?? 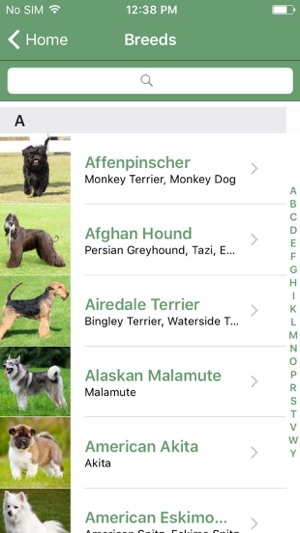 And also; Of course this app won't have every dog breed on the planet. It also depends on the lighting and the angle you take your photo. 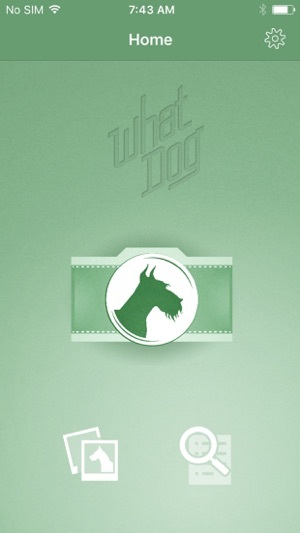 Look, honestly, this is very good for an app that just analyzes your dog's photo and matches it with bing images. I have 2 Siberian Huskys and I did my white puppy who was looking out the window. Know what she got? Dogo Argentino and Eskimo Dog. That's pretty good. 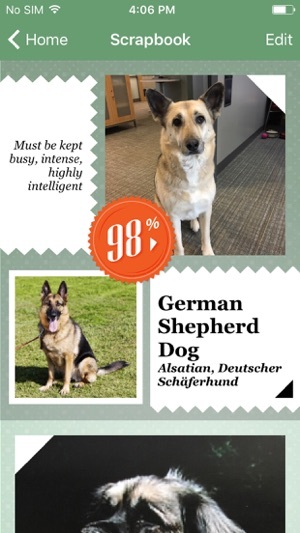 And I love how it gives you facts about different dog breeds! Great source of quick-information! I rated it 4 stars because my dog had a fairly thinner face than a Dogo Argentino and she had a visibly curlier tail and pointy ears. Still, Dogo Argentino and Eskimo Dog were very good and close guesses. It recognizes color more imo, to stop the 2.4 stars it could recognize bodily structure and different poses of it, too. I think that this app is mostly accurate. It took a while for it to get my dogs breed, but that’s because the photos had to be 100% clear. If they are a mixed breed then they are pretty hard to discover, I tried it with a few photos that weren’t actually dogs and it still gave me some results and sometimes it didn’t. I think it’s cool that this app just scans over a picture and notices features that belong to your dog, it also tells the history of your dog but some of the info is wrong. Like the height of some dogs are usually taller or smaller than the average number. it also had some glitching in the start that prevented me From choosing a photo. I recommend taking more than one image of your dog and I think it’ll be accurate. Overall, it’s good and pretty accurate.